Teachers routinely silencing a class by shouting and yelling are very frequent happenings and therefore, they go on without much deliberation. But, if we took a moment to introspect we might actually realize that we are teaching students the wrong way to conduct life. Unfortunately, many students also use these same methods when similar situations arise in their lives. For example, students, when handed out leadership positions, resort to such methods because it seems to work for their teachers. However, their leadership abilities are questioned and as we all know, anger is not the most endearing leadership trait. This got me thinking, can we reverse this trend? Can a positive and pleasant disposition of teachers create a better impact on students? Teachers resorting to such loud, hitting-the-pouch-on-the-podium techniques to silence the class may seem efficient, initially, but they leave behind a negative and unpleasant feeling in the class. Often, it is the teachers who talk about emotional stability and how to stay calm in extreme situations. But, a student forgets to bring his book and the teacher goes haywire! These acts make students doubt the legitimacy of the teacher’s words; also, sometimes, they are mocked at for their behaviour and labelled ‘hypocrites’ by the students. Teach as if this is your last class. Then, will you have time to shout, reprimand the students? No, you could be a role model for your students to follow in terms of happiness, passion for what you do. You will be noted for emotional stability because if you do anything as if it is about to end, you give your best. Use a reusable pen. 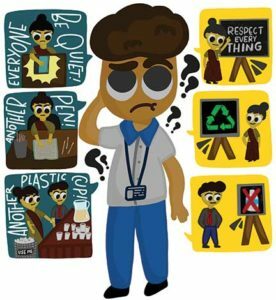 This suggestion may sound odd, but as you already know, plastic waste is dangerous for the environment, something you must be teaching in your classes. Disposable pens are made of non-recyclable plastic. Therefore, switch to reusable pens to show that you’re being environmentally-conscious and not just talking about it. Similarly, if the school canteen uses plastic cups to serve tea and coffee, bring your own cup. Don’t slam a student’s pencil box on the table to stop the class from shouting. It is the standard dialogue of all teachers to tell their students to respect their belongings. But, when teachers employ such methods to control the class, they are inadvertently expressing their disrespect for things. Similarly, please don’t fling a chalk at an inattentive student for the aforementioned reason. Of course, these are only a few ways to ignite changes in a teacher’s demeanor. There are a million ways to do so, and personally, I feel teachers should figure it out themselves as it will be more original, creative and relevant. These suggestions may look insignificant and small, but if you pay attention to the little things only then can you perceive the big picture. That is why I call these “subtle hints”. These are actions that require no communication but will have a profound communion with those around you. They subtly hint at your level of awareness in each aspect of your day and might inspire your students to try out the same and a beautiful world might unfurl. I know that teaching is a demanding job and facing 40 bundles of energy emitters can be hard. I also understand that a teacher’s intention is to do good for us; all I wanted to do was to give a better method to do good and create awareness among teachers. In an era where teachers are no longer ‘mere purveyors of knowledge’, I think it becomes pivotal for a teacher to become more reliable than any other distraction a child might face. Teachers are capable of creating an impact that can be far beyond their imagination; it can either be positive or negative. It is up to the teachers to make the right choice. I would like to end this article with a quote by my favourite fictional character, Albus Dumbledore, “It does not do to dwell on dreams and forget to live.” Similarly, it does not do to speak and forget to act. Let’s make it happen; make our words count through actions. The author is a student of class 10 in Delhi Public School, Coimbatore. She is a nature lover who identifies herself with the kindred spirits of romantic poets. Her wander lust is fulfilled by everyday cycling expeditions and travelling. She intends to create sustainable lifestyles and zero waste homes in the near and foreseeable future. She can be reached at aish3rs@gmail.com. This article is Good ..